Everyone knows that walking is great exercise. It is good for your heart, lungs, and all of your muscles. But walking in the country is just good for your soul! I love to go for nature walks and try to walk at least every other day. I always take my camera with me and try to capture some of the beautiful and unusual things I see. Come with me and let’s take a walk in the country. It’s early morning and the sun is just starting to come up. The gray fog is still looming among the nearly bare trees. It is very early in spring and these pecan trees are some of the last trees to bud. You can’t really see them here, but you can see the grass starting to turn green again underneath them. These two white tailed doe are out early, looking for some of the green grass that is beginning to emerge through the dead leaves still laying on the ground. They like foraging in the fog as it helps to conceal them while they are eating. There are normally quite a few deer in this area. They usually hear me before I see them, I guess we got lucky today! Here is a small pond on the back of our place. As you can see some of the trees are beginning to put on their new green leaves now. The sun has burned through the fog and the new leaves are such a brilliant green! It is a very still morning with no breeze at all and I caught the reflection of the trees on the quiet surface of the pond. 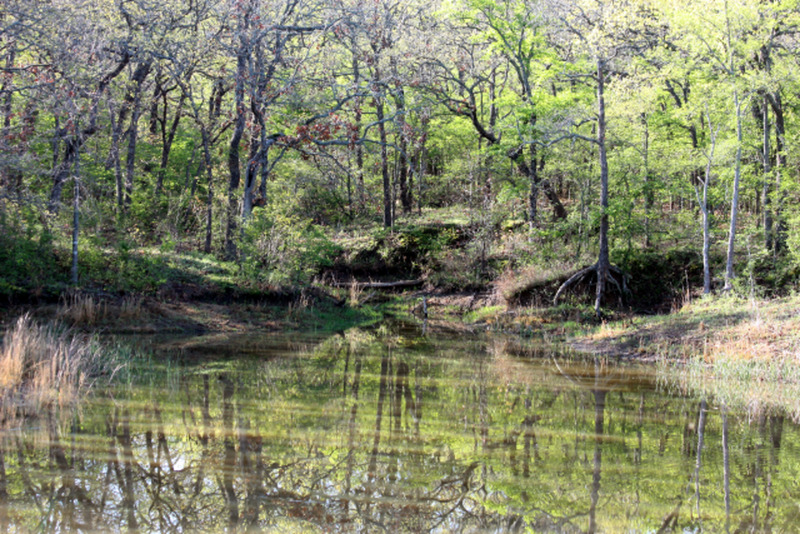 My husband and I fish on this pond, as there are bass and catfish in here. This is also where I see many deer and turkey when they come here to get a drink. There are also ducks on this pond in winter and early spring, let’s see if we can see them before they see us. This male Redhead duck has just come in for a landing. 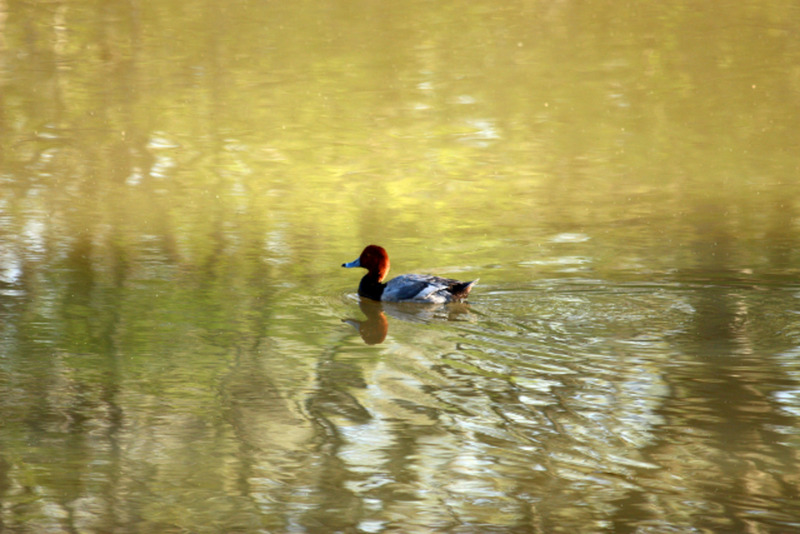 Redhead ducks can be easily identified by, what else…their red head. They are normally winter in this area and most of them have already flown back north for the summer. Female redheads don’t normally make their own nests, but will usually lay their eggs in the older nests of other ducks. I don’t see the female, she must be hiding among the reeds somewhere nearby. The females seem to be a little more skidish than the males. I am surprised this male is being so cooperative, he really doesn't seem to be very afraid of us. Let's not get too close and scare him away. 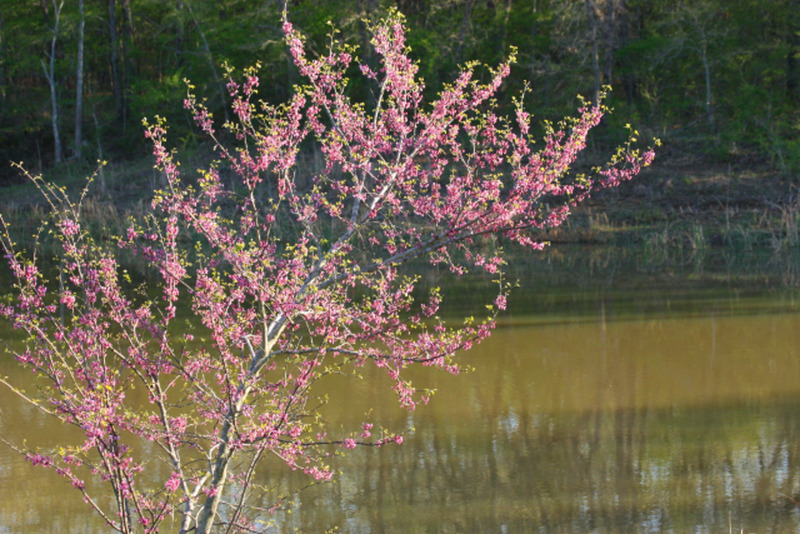 There is a young redbud tree growing on the pond dam. It is just starting to put on its bright green leaves. I love redbud trees! They bloom early in spring and add such a pretty pink color to the landscape. They grow wild here in this area and there are many of them scattered among the blackjack trees that grow here. From time to time, I will dig up a little redbud tree and replant it closer to the house so I can enjoy looking at it out the windows in spring. 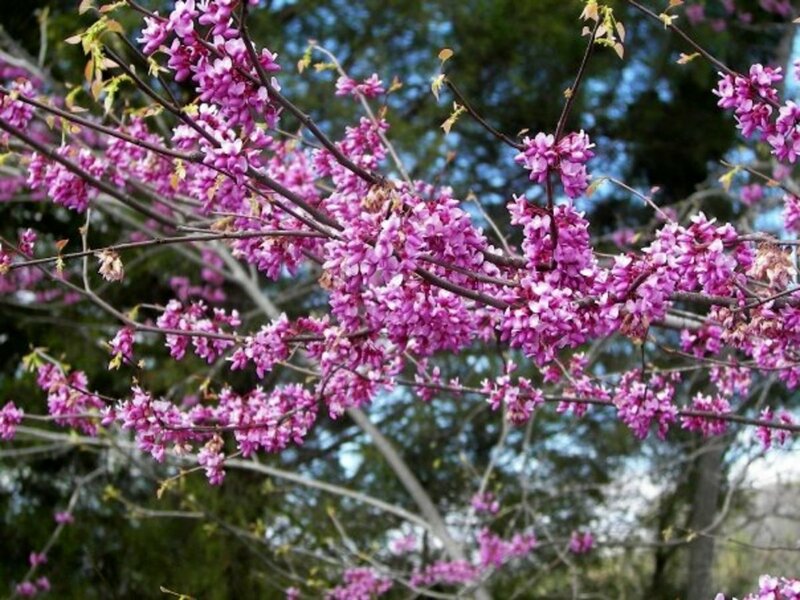 The redbud tree is actually the state tree of Oklahoma but also can be found as far north as New York state and southward to Florida. Native Americans were known to eat the blooms either raw or boiled and roast and eat the seeds too. I don’t think I will be trying that myself, what about you? Here is our walking trail. 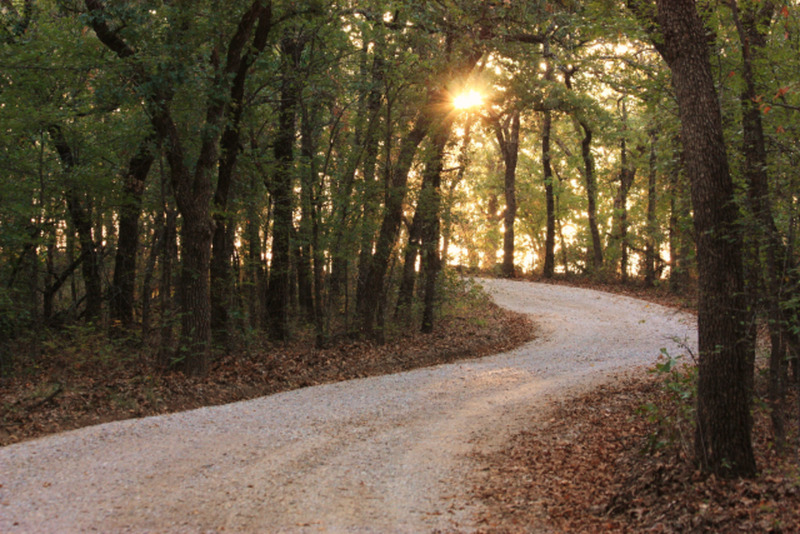 Let’s walk down the trail and see what we might discover. The sun is now shining brightly through the trees and the birds are singing all around us. There are a lot of cardinals back here. If you watch, you will see a red flash as they fly by. As you can see, this trail is used quite often. It leads from the front of our property to the back, until you reach the creek, at which there is about a 100 foot drop. The creek itself doesn’t always have water in it and you can cross it to the back 10 acres of our property. My husband is “allowed” to deer hunt back there. I claim the deer that come towards the front of our place as my deer and he is not “allowed” to hunt them! (Don't tell him I said that.) 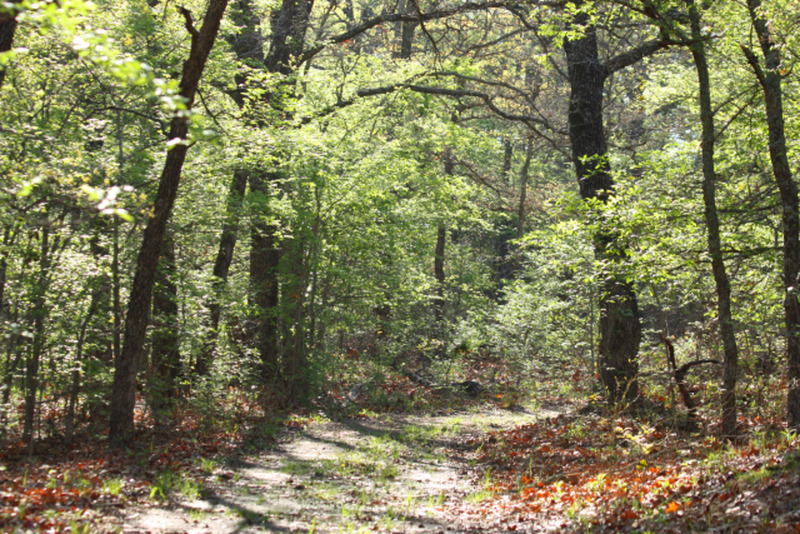 Let’s walk on down the trail now and see what else we may find. Awesome! 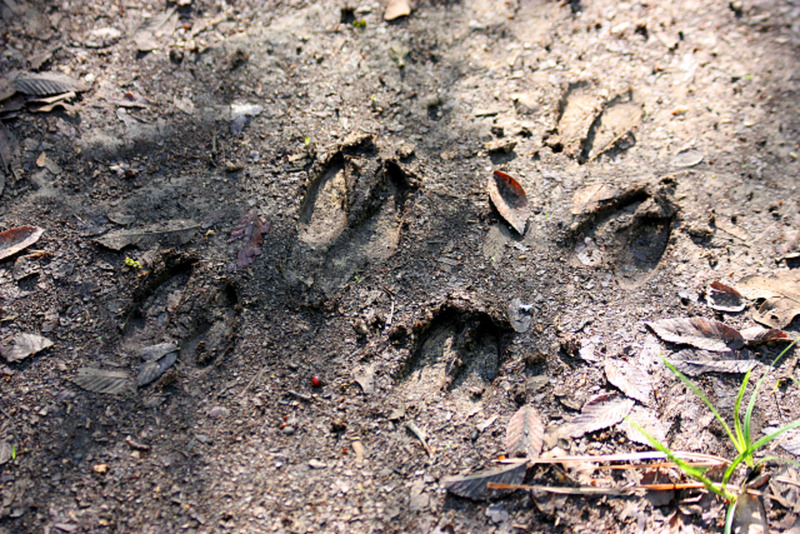 Look what we have found, deer tracks. It looks like two different deer have walked down this trail recently. Probably a doe and a year old fawn. See how the tracks in the back are smaller? White tailed deer and very common in these woods. They are one of the smaller species of deer. Their tail is white on the underneath and they will raise their tail and “wag” it like a flag when they feel threatened. The will also “snort” a warning to other deer that there is something they fear nearby. I can usually hear them snort and then will see their white tail flashing, as they are running through the woods. We have to be careful when walking through the woods in spring. It is a little early yet, but the does will be having their fawns soon and are very protective of them. If we were to unknowingly get too close, the doe will attempt to chase us off. They may seem timid, but they can be quite dangerous when protecting their young! Here are some recent turkey tracks! They are easily recognized by the three-toed print. 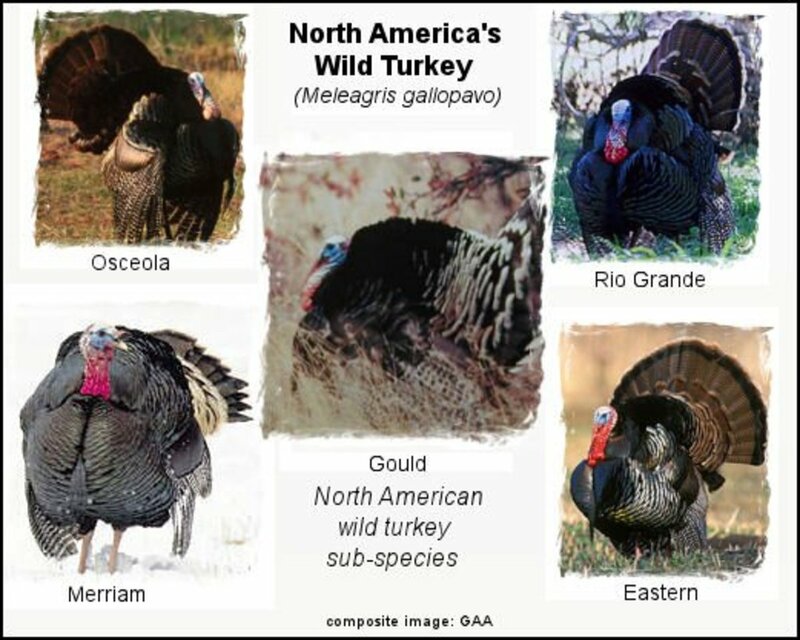 Wild turkey are plentiful around here and you can hear them “gobbling” in the springtime. If we listen carefully, we might here one. They normally come out either early in the morning or early evening. They don’t stay out very long in the evening as that is when the coyotes and bobcats, which are their main predators, are out looking for food. Turkey do fly, but they are not what I would call graceful about it. They roost in the trees at night and “rest” during the heat of the day under foliage. Yes, my hubby hunts turkey too, but only on the back part of the property! There is not much better than a good ol' smoked turkey leg! Johnny does the hunting and the cleaning, I do the cooking and we both do the eating! 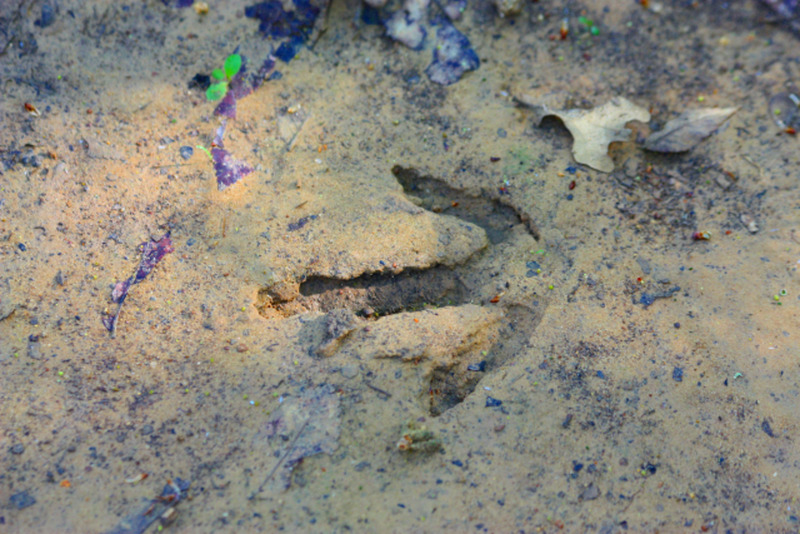 This looks like a big turkey track, it must be a big tom turkey. 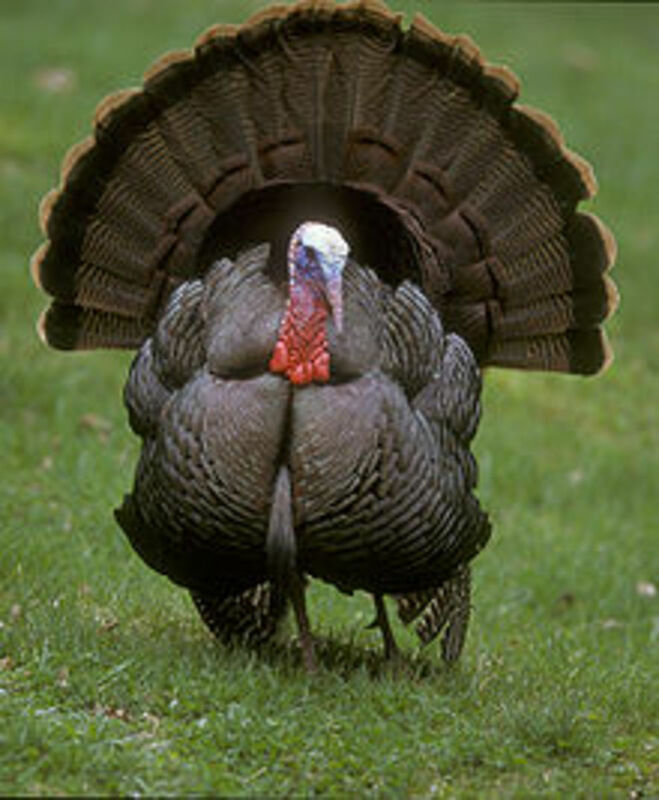 Hmmm, turkey season starts soon, I may have to send Johnny back to the back acres soon. Our walk for today is about to come to an end. 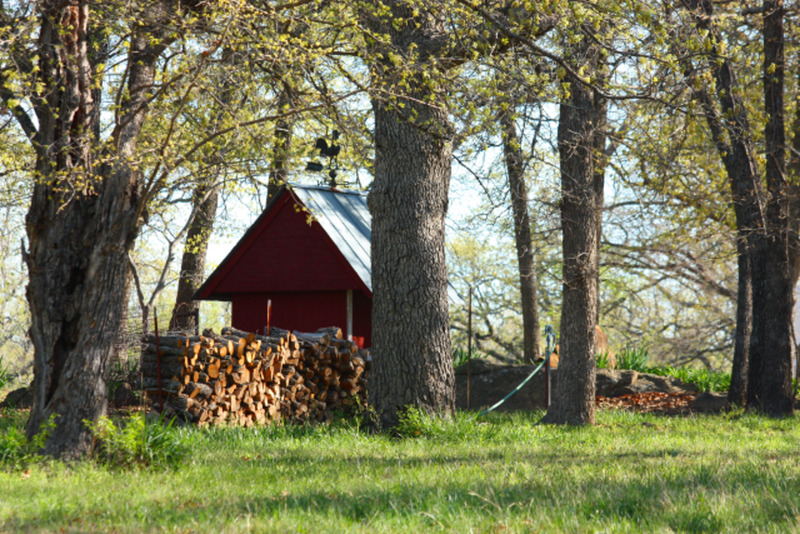 This is the little red well house that is in our backyard. We live far enough in the country that we cannot get “city water”. We have a pump inside the well house that pumps the well water into the house. My family and friends say that we have the best tasting water they have ever tasted. Myself, I don’t drink much plain water, but I know it sure does make great sweet tea. You can also see our stack of firewood for winter. When we have to cut down a tree for some reason, such as thinning some of them out so they others will grow well, we cut up the tree to use for firewood in our fireplace. I usually wear gloves when taking in firewood, as this is a great place to find scorpions and snakes. Watch where you step as you walk by! Before our walk comes to an end for today, we have to walk by and see the daffodils. I love daffodils, they are so bright and cheerful. They are usually the first flowers to bloom in spring and just jump out at you with their bright yellow faces, letting you know that spring is here. 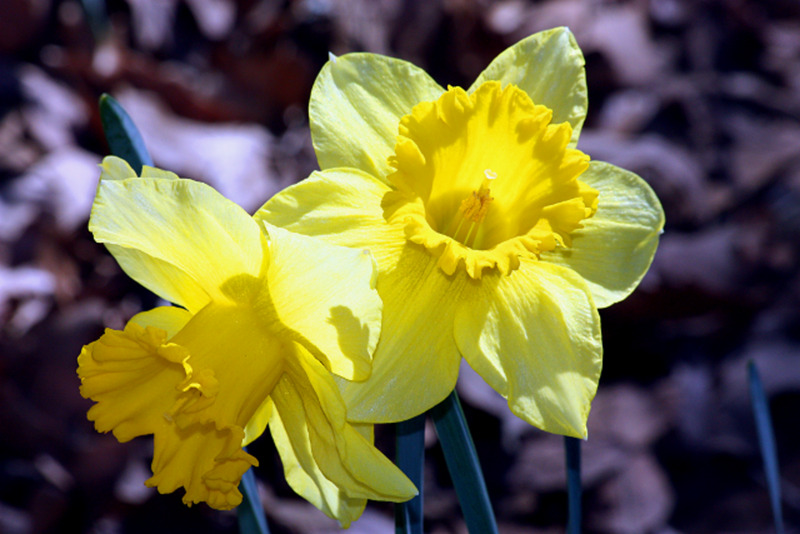 Daffodils are grown from bulbs and are one of my favorite flowers to grow. They need nearly no care. You plant the bulbs in fall in a place that will get plenty of sunlight and come spring the will pop up and greet you with a bright yellow smile! Well that ends our walk in the country for today. I hope you have enjoyed our walk as much as I have. I’m sure we both needed the fresh air and exercise. I love to go walking and plan to go on many more walks in the future, so be sure to watch for more, you never know where we might go or what we might see! Did you enjoy our walk in the country? Yes, I love going for nature walks! No, I'm really not much of a nature person. Everyone has times that you feel stressed out and up tight. These are the times that you just need to get a way, relax and clear your mind. I wonderful way to do that is to flower garden. November: What Needs to Be Done in the Garden and on the Homestead in Upstate New York? good morning sgbrown...you are so right...walking in and among the beauties of nature is good for your soul. There is a spot not far from my home where I go to walk and enjoy the surprises that I find there---simple beauty that changes who I am a bit each time I walk there. I walk more often around the small town in which I now live and often find new and lovely plants and flowers and am witness to precious birds and squirrels making there way somewhere. Oh, this is my second walk with you and I'm not a bit tired...ready for more! 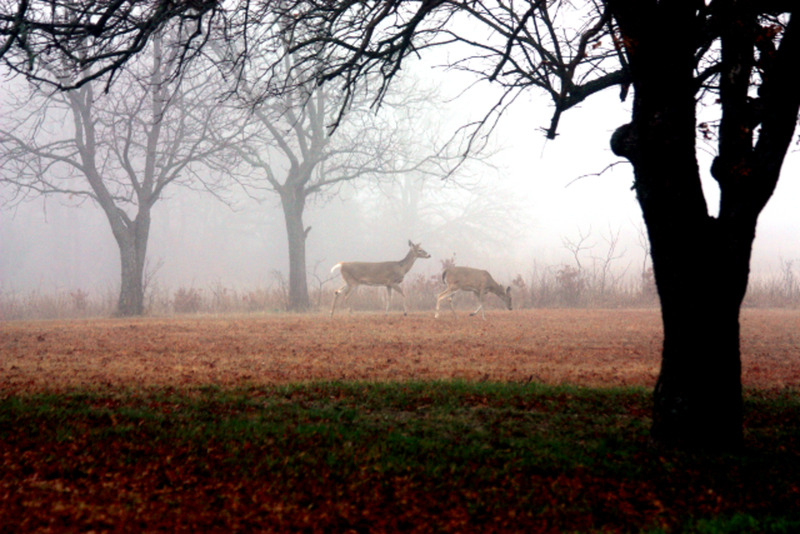 I love that foggy deer picture. And your red-headed duck was such a great shot as it landed. You pictures are all so good...your camera must be good too, but your eye and finger are perfect! I did not know you could eat Redbud flowers but guess that is not surprising - I will try that this Spring! And, I am jealous of your 'real' well water! Loved walking with you again! It was a pleasure to walk with you. The pictures were all lovely, and your descriptions added so much to them. Voted up and beautiful. Beautiful photos. I especially like the pics of the woods. I miss being in the country where one can hear silence or the birds sing. You're so lucky to be where you can have a nice walk in the country! Up and awesome. Will share. Hello Bethany. Thank you for your kind comment, I'm glad you enjoyed my hub. Have a great day! Waking around the corner is just so relaxing. It really help us loosen up everything that is bothering us.. This hub is so good..! You are very welcome! I meant every word. Of course! You may call me Sheila, and what may I call you? I look forward to many walks with you sg! Thank you for the awesome fanmail you left! Can I call you something other than "sg"? Hello bravewarrior! I tried replying to your comment earlier, but have been having computer issues, and it just disappeared! Thank you so much for such a wonderful comment on my hub! I am definitely thanking billybuc for mentioning my in his hub which sent you my way. We searched for 14 years before we found this place in the country, I hope you find yours soon! Have a wonderful day and thank you again! What a beautiful journey! I was led your way by billybuc and had no idea I'd go on such a nature walk. I'm envious that all of this beauty and wonder is on your property. Aside from being a writer, my dream is to have property that offers all the quiet and awe Mother Nature has to offer. I'm so glad I went on this trek with you. You versed the photos in such a way, that I was actually there. Phenominal writing! I think Bill has sent me another keeper! After I hit the comment button, I'm going to your page and entering into the beautiful world you so eloquently share! Hello Trinity M! Thank you so much for your kind comment. I'm glad you enjoyed my hub. Thank you for stopping by. Have a wonderful day! What beautiful pictures and what a lovely place to live in. Thank you for sharing such beauty with us. Wow! The pictures were spectacular! Thank you for the tour; it was beautiful! By the way, you might like to read my hub on Wednesday; there is a very real chance you will be mentioned in it. What an absolute treat for me, I loved this walk by your side and you showing me so much along the way. The does in the fog - oh what a beautiful photo, with the shadow in the foreground and the glorious light in the distance. The pond looks amazing, what a beautiful place to take a walk, the redhead ducks look quite regal compared to our common wild ducks. Birds and water, ripples and reflections - a photographers delight!!! The tracks are interesting and freshly made too, so the deer couldn't have been too far away!!! The play of light on the daffs is stunning and the little well house and woodpile are intriguing. If you can't tell, I am very excited by this walk, the photos are beautiful and thank you for the commentary. Lovely hub, I look forward to reading lots more by you SG, thank you. My votes and best wishes to you, and sharing! Your last daffodil photo did not show up for some reason but I loved getting to see all of the other photos you took on your property. Such a lovely area! Of course your photography is also so very beautiful. Could almost hear the birds singing! Thanks for this walk in the country. Up votes + tweeting. You've taken us along a beautiful walk with you today. The view was breath taking and the commentary was wonderful. I wouldn't have been able to recognize those deer tracks as we don't have them on our property and besides, I'm a city person lucky enough to have moved to the country. What a lovely place you have to live! The photos are wonderful, and the narrative, too. Thank you so much for taking us along on this peaceful walk. Not too far from where I live in my congested community is a county park with a huge lake. One of the joys of walking there is seeing wild turkeys. I expect to see deer and waterfowl, but the turkeys are always such a surprise. Apparently they adapt well to encroaching development, as deer do, yet they seem so much more wild. I never thought of taking pictures of deer and turkey tracks...great captures with your camera! Thank you for taking me for a walk in the country! Beautifully written and wonderful photos. I miss the woodland walks, but wildlife here makes country walks a little less relaxed ... i.e King Cobra territory! (would make a good photo though, I just might not get it published lol). Your pictures are gorgeous. I can't wait for the sun to shine again. It has been so wet and dreary here in WA! I have so enjoyed this walk today, your photos and descriptions are wonderful, I hope we can do this again soon! Wow...this was wonderful hub. I love all stunning pictures here. My friend, you make my morning so beautiful. Thanks for share with us. Good job and rated up! you are so blessed to have a beautiful place such as this to enjoy. Mother Nature in all her splendor. What a great experience, thanks for taking me with you, and next time we go bring some snacks for a picnic. there would be nothing so fine than to picnic in this wonderful place. hello sgbrown, I just wanted to tell you that your daffodils photograph is now my desktop background, I liked thet so much. What a lovely way to present your nature walk, and the photos are fantastic! Wonderful! its what i really wanted to do, to feel this tranquility ....nature attracts me, its my passion....and your lively photos really made me spellboud..the woods, the daffodils & & the bathing readhead duck are marvellous and it took me subconciously to the beautiful place where you are lucky to have enjoyed in. Voted up ! I hope to have a place to grow them outside by next year. Of course, I have been hoping that for two years. wow, beautiful hub and beautiful pics. I enjoyed it thoroughly, you are such a talent. you photographed dafodils so beautifully that I kept on watching them for a while. I am following you now.voted up. Wonderful hub sgbrown! Wonderful. Voted awesome! Wow, sgbrown, I think you out did yourself with this Hub! Beautiful pictures, and what a great way of bringing those pictures alive with your words. I felt like I was walking with you along that trail..... Excellent piece! Beautiful pictures, I envy your walking path. Daffodils are my favorite flowers and they always herald the coming of Spring for me. I used to plant tons of them every where we have lived but in this apartment, they don't allow. Beautiful hub. I'd love to walk down that wooded trail, looks enchanting and the well house with the firewood piled outside, looks like something out of a fairy tale. Voted up etc. Beautiful! I love your photos and I'd love to have a place like that to walk. I walk just about every day, but I have to walk on our road and it can be busy at times. I also have well water and it is the best tasting water I've ever had. Deer Park water is good, too. Love the daffodil shot! Awesome! Voted up, beautiful, and awesome! Great job!